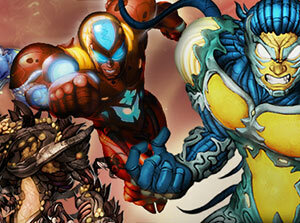 Biowars: Anthropomorphized immune and nervous system cells in mortal combat? Yes please! Perfect for converting kids from comic nerds to science nerds. 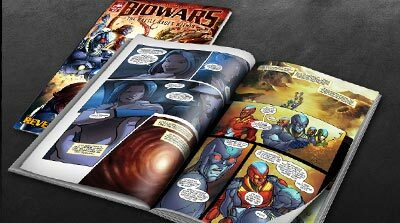 National Video Games Examiner Patrick Hickey Jr. chats with Biowars creator Gabe Shaoolian, who discusses the series impact on both the comic book and video game landscapes. Patrick Hickey Jr.: How did the original idea of Biowars sprout? 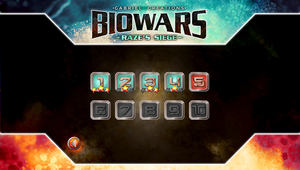 Gabe Shaoolian: Biowars started as a hobby for me. I studied biochemistry at NYU and I became fascinated with how our bodies exist as micro-universes and the daily battles for existence that take place within them. I wanted to share my vision with everyone and open their imagination to understand how amazing our inner worlds are. I feel incredibly fortunate to have the means to share this story digitally with readers. Hickey Jr.: Your site is so much more than a video game or comic book site, what was the idea behind that? Shaoolian: I wanted to create a digital community and bring the digital comic book to life in a new way, and take these characters from a reader’s imagination to their fingertips. 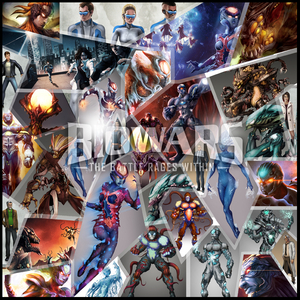 I wanted to create a digital space where fans and newcomers could interact, share their own Biowars artwork, create Biowars-themed memes to share with their friends, and interact with our Biowars surveys and polls about topics related to immunology. Recently, pop culture has been obsessed with SCIENCE. Science, as well as being a geek, is the hottest thing to incorporate into our entertainment – TV, movies, books, and even, comic books. Do you love biological science? 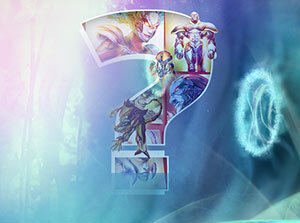 Do you love entertaining comic books? 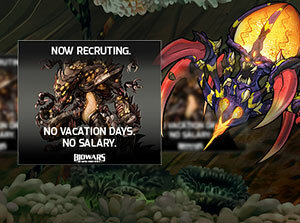 If you answered yes to both, then I have to introduce to you: BIOWARS. 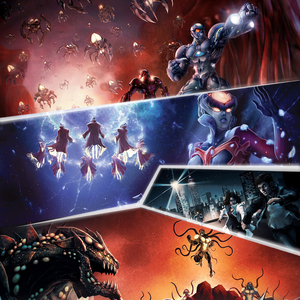 You’re probably thinking this may be a biology lesson inside a comic book, and in a way – it is, but they place it in a interesting setting where you’re watching alien-like creatures battling it out. In Alexander Hawking’s case, his body contains a germ, given to him by his father, that was designed to annihilate the human immune system. He must stop at nothing to bring the information regarding the evil pathogen to the right people, while fighting against the pathogen in his own body. That’s where the biowarriors come in. The human body has defenses to protect itself and in this story, they have created them into actual warriors fighting against the germs. 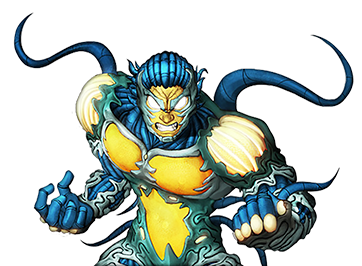 In the comics, we are introduced to The Council of Mind who are basically the leaders to the body who sense a threat in the body and sends their messenger (through the nerve cells) to deliver the news to the B-Cells squad’s leader Blastor. Working with the Natural Killing Cells (who are willing to kill their own allies, if infected) and the Macrophages, they take on the infection inside the body. We learn more about each division and what each team does. The characters – consisting of a supreme council, defenders, messengers, intelligence officers, and healers – are pretty serious for the most part, except Humron (B-Cell warrior) who is pretty funny. 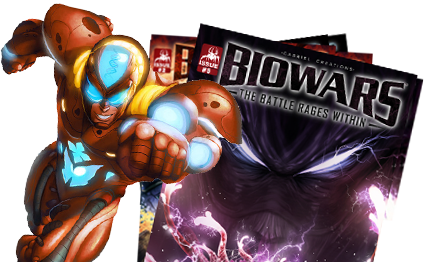 BIOWARS™ The Battle Rages Within is a new online comics series launching November 19. This richly-illustrated adventure story brings a scientific twist to the modern-day superhero battleground. 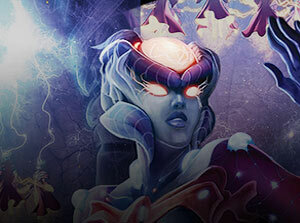 Subscriptions to BIOWARS are free with registration at www.BIOWARS.com. 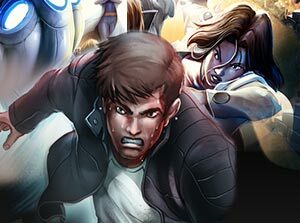 Storyline: The unlikely hero of Biowars is Alexander Hawking, a regular guy attending a city college. Alex's father Marcus is a scientist who becomes a target of a secretive group called The Combine. They infect Marcus with a deadly germ that he inadvertently passes to Alex, and with it, a destiny. With his dying breath, Marcus makes Alex vow to expose the ruthless cabal and save the world from their threat. To fulfill this quest, Alex's immune system must fight off the microbe that has invaded his body, where a parallel storyline takes place. The inner-realm of Alex's body is a universe unto itself – the BioCosmos - an alien setting where strange creatures inhabit living terrain and glide through pulsating corridors. 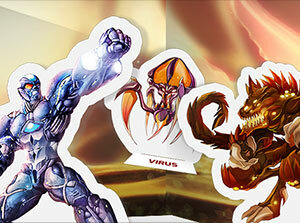 Each of these beings, known as BioWarriors, is a hero of the Nervous and Immune Systems. 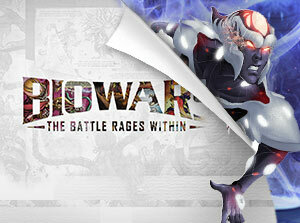 In Biowars, they are given humanoid forms, but they retain their real-life biological powers. The invading microbes also manifest their true menacing powers and are given monstrous designs. There are so many superhero comics out there but readers are always open to a new wrinkle. How about a comic that encompasses a world made up of trillions, a hundred times more populated than Earth? That is a world that we all live in now, inside our own bodies, made up of trillions of cells. 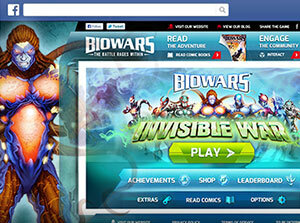 Welcome to BIOWARS. This is definitely something new within the superhero genre. What will first interest readers is how this comic engages with real biology. 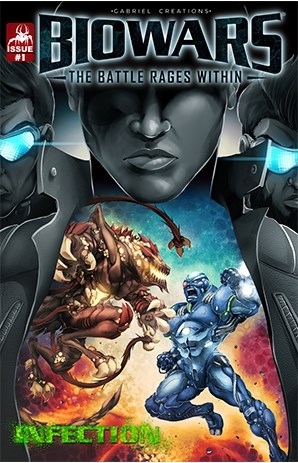 With a majority of superhero comics heavily tied to either pulp fiction or mythology, BIOWARS, published by Gabriel Creations, confidently goes deep inside a vast alien world with many possibilities. Creator Gabriel Shaoolian envisioned a comic that dove into a whole new terrain. With a story that literally takes place inside and outside, there is great potential here. The story begins with a sounding of alarms in the first issue, aptly entitled, “Infection.” We see the emerging war take shape. 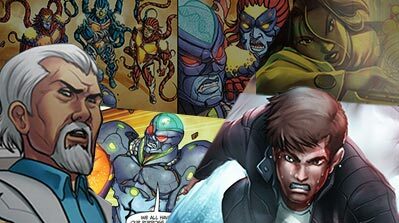 Written by Mark Powers (Marvel Comics, Devil’s Due), we get a nice dose of action, and even humor. 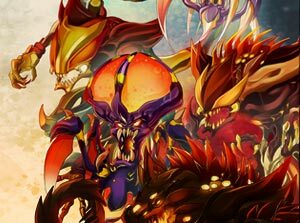 Microphage armies and B-Cell forces, given human-like form for the sake of more vivid storytelling, are deployed to subdue the enemy invader. 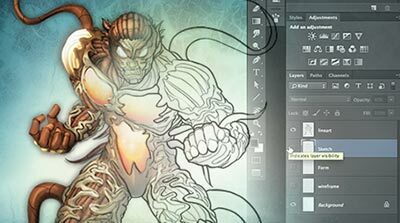 The artwork (Lucius Cross, Joana LaFuente, and Gonçalo Lopes) brings it all to life with impressive results. The next time you get a cold, you can picture a war like this one raging through your bronchial passages. 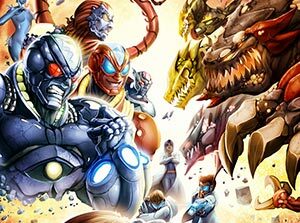 The BIOWARS interactive website and online community allow fans to read and download free digital comic book issues, play a series of app games, learn more about the characters and their real-life counterparts, upload their own stories and artwork, engage with other fans of the comic series, play online and social media games, and much more. 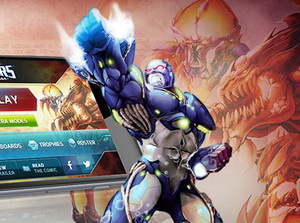 The in-house development of the BIOWARS mobile app games underscores the agency's technical abilities, a unique element and game-changing offering from Blue Fountain Media. As a former pre-med student at New York University, Mr. Shaoolian was fascinated by the ways cells communicate with each other. 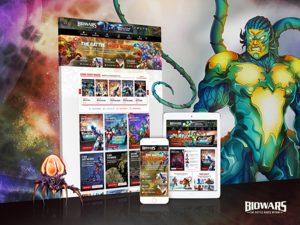 He created BIOWARS to share his passion for immunology and open the imagination of millions of readers and gamers through a broad range of entertaining and interactive experiences across digital media. 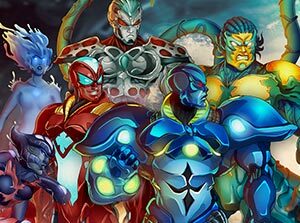 He brought together a seasoned team of Blue Fountain Media artists and designers, as well as a renowned comic book writer, to help bring his passion to life. From story and character conception, to illustration, production and marketing, Blue Fountain Media has created an immersive digital experience that showcases its creativity and capabilities. "To engage with today's consumers, businesses have to deliver more than just a website: they need to deliver an immersive experience," said Mr. Shaoolian. "What we've done with BIOWARS represents our team's capabilities and the strategic work we perform for brands across various industries. We help clients tell compelling stories digitally to further engage and interact with their customers and, ultimately, drive business results and impact their bottom lines."